The RYOBI Premium .080 in. Twisted Line is the perfect accessory to any of your RYOBI cordless string trimmers. With this innovative twisted line, slice through thicker weeds, grass and light brush with ease. For user convenience, use one of the pre-wound replacement spools or, for DIY replacement, use the bulk line donut for 50 ft. of line. After you finish mowing your lawn, a string trimmer and hedge trimmer can spruce up your yard by trimming hard-to-reach areas mowers can't get to. Touching up areas along fences and driveways gives your lawn a polished look and helps to improve the overall appearance of your home, so stop fiddling around with those hand clippers and pruning shears, and make things easier by adding a little extra outdoor power to your life. The AF-100 string Trimmer line is an OEM Replacement AFS spool for the following models: GH610, LST220, LST136, ST7700, CST1100, CST2000, NST1024, NST2018, NST2118. Repairing your Powers Brand Shower Faucet is now easy and economical with the JAG PLUMBING PRODUCTS replacement pressure balancing spool Kit. This Kit is made to repair the Powers Series 400 and 410 Models. JAG Plumbing products strives to bring on-line Customers the best replacement and repair parts available to North America. Experts in the field of non-OEM repair parts; JAG Plumbing offers customers a selection of economic solutions for their every-day home plumbing repairs. Based in Ontario Canada, the Team at JAG scours North America to bring on line customers unique, hard to find parts of the highest quality. The Magnum 250LX spool gun is a professional grade solution for feeding small spools of aluminum and steel wire. Featuring a 280A 60% duty cycle rating, the Magnum 250LX is a combination of durability and performance. The gun is well balanced and lightweight, and the unique oval shaped handle with finger ribs ensures both comfort and a sure grip. The Magnum 250LX is an ideal complement to the Power MIG 350MP and the Power MIG 255C. A fixed spool brake with independent wire leveler prevents wire tangles with no adjustments to fuss with. A multi-turn wire speed adjustment feature allows for wire speed remotely at the gun with fine resolution. Standard Magnum expendable parts, which shares the same contact tips and nozzles as the Magnum<sup></sup> 300 gun reducing the amount of parts needed, including a replaceable barrel. A large covered drive roll compartment opens easy and wide providing a large space to make threading wire simple. 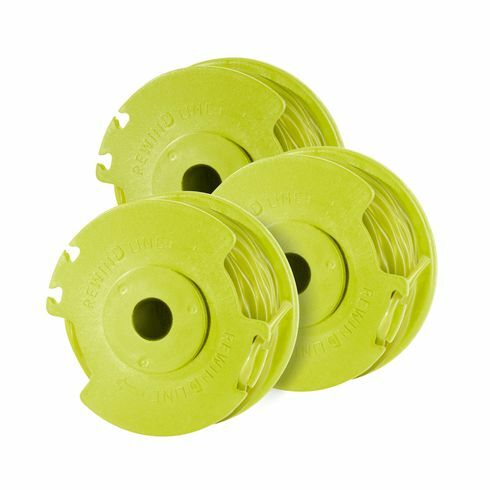 Replacement Twisted 0.080 Auto Feed Line Spools (3-Pack) The RYOBI Premium .080 in. Twisted Line is the perfect accessory to any of your RYOBI cordless string trimmers. With this innovative twisted line, slice through thicker weeds, grass and light brush with ease. For user convenience, use one of the pre-wound replacement spools or, for DIY replacement, use the bulk line donut for 50 ft. of line.